Metropolitan Kallistos Ware, one of the most prolific writers and prominent Orthodox theologians of our times, sat down with TNH in Boston. 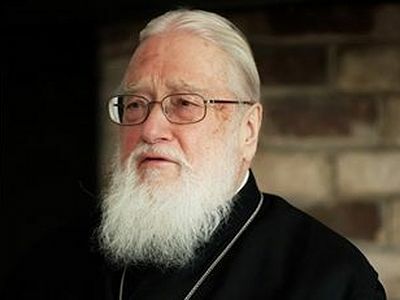 BOSTON, MA – Metropolitan Kallistos Ware is one of the most prolific writers and prominent Orthodox theologians of our times. Worship, the mystical tradition and especially the prayer attracted him, so six years later he formally converted to Orthodoxy. Since then, he has become the preeminent voice of Orthodoxy in the West. 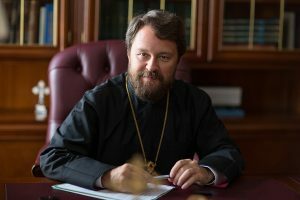 TNH: What are some of the most pressing challenges the Orthodox Church faces today? KW: One challenge is the situation of the Orthodox in the Western World. We are divided into so many different jurisdictions; we have many Orthodox Bishops in the same city. If we could be more closely united with one another, we would have a far greater influence. TNH: Obviously, you are talking about the problem of Diaspora. According to your estimation what is the most practical way to resolve this problem? KW: If I had a simple and clear answer to that question, then you could immediately make me Patriarch of the West. I don’t think that there is at this moment a complete solution. But the first step forward is to develop in each country Episcopal Assemblies gathering together all the Orthodox Bishops in that country – and this is already happening. Of course, in many countries, inter-Orthodox Conferences had existed in the past, in America you’ve had SCOBA since 1960. These Episcopal Assemblies need to be develop, need to be given greater authority, and this is, I think, the best thing that we could do at the moment. TNH: Don’t you think that we should make the differentiation between Synaxis (Assemblies) and Synod? KW: Yes, at the moment we have inter-Orthodox Assemblies (Synaxis) but they have not yet become, in a canonical sense, Synod, and so we must work towards that. TNH: Regarding the ministry of women in the Church, do you think it is practical to go back to the ancient tradition of the Church of the Deaconesses? KW: I certainly would welcome the revival of the Order of Deaconesses, it was never officially abolished. Their main function in the early Church was to help at the baptism of adult women converts, and when adult baptism ceased they tended to disappear. But if we revive that Order today, we could give them new and different functions. They can help in teaching the work of the Church. They could be appointed to preach homilies in Church. TNH: May we speak of the ordination of Deaconesses, since their ordination took place in the Altar during the Eucharist. THN: I think we need to study the whole question of Deaconesses closely because they were not regarded necessarily the same way everywhere in the early Church. Yes, in some places in Christian East they received an ordination very similar to that of the Deacon, and in that sense we could regard the Deaconesses as ordained. In the West, on the other hand, I think they were not so regarded; they were not considered ordained. So, what is needed in the Orthodox Church today is a more thorough discussion of the meaning of the ministry of Deaconesses and how we are to understand that role is not a question of reviving the Order but what we actually would be reviving. We also need to revive the Order of Deacon for men because for most men, it is just a step to the priesthood. So, I think we need to look at the whole question more thoroughly. TNH: What happened to the Ecumenical Movement? Is it dead? KW: I do not think it is dead, but it is tired. On the other hand Christ at the last supper he prayed for the unity of all His disciples and it is undoubtedly Christ’s prayer that we should all be one. So, if we are engaging in discussions for unity, we are acting in obedience to Christ and that doesn’t mean making compromises. We must remain faithful to the fullness of the Orthodox Faith, but we should be ready to share that faith with others and not only to tell them what we believe but to listen to them and try to understand their own problems and hopes. I regard work for unity as a necessity for us Orthodox today. TNH: What attracted you to Orthodoxy? KW: The first thing that attracted me was the worship. That day, at age 17, inside that Russian church in London, I felt that Service spoke to my heart, that this was my true home. I waited six years before I became Orthodox. At that time in England the Orthodox were the old immigrants from Greece and Cyprus and Russia, and the Orthodox clergy usually said “we are not a Church for English people, we are here for Greeks and Russians,” but they eventually accepted me. Church worship is a heaven on earth. I felt in a very strong way from that very first time the unity of the earthly worship the visible congregation with the worship in heaven with the Church of the saints, the angels, the Mother of God Christ Himself. Then, when I learned about the Orthodox faith, I felt the fullness of faith I did not discover in any other Christian Body and I was particularly attracted by the tradition of mystical prayer. TNH: Your Eminence, what is death? KW: Death in a visible sense is the separation of body and soul and this is something contrary to God’s intention. It is the result of the fall, and so as Christians we look beyond death to the resurrection of the dead at the last day. In this way, death should be seen not as an end but as a beginning. Death is the start of a richer and fuller life with Christ. TNH: Are you afraid of death? KW: Of course I am afraid of death. Because it is only human to be afraid of death, and we understand so little about death. We are afraid of the unknown, and I am afraid of death because I know I am a sinful person and not yet ready to come into the presence of Christ. But I also look toward death with hope. I believe that our fellowship with Christ after this life will continue in richer and fuller form. TNH: What is hell and what is heaven? KW: When we speak of punishment in the end is not God who punishes us, we punish ourselves. We are created in the image of God; we find our joy and our human fulfilment in loving God and loving our fellow humans. But God doesn’t force us. If we refuse the love of God then we shall make ourselves deeply unhappy. When we speak of hell, this means the refusal of God carried to the outmost limit. But it is not God who puts us in hell, we put ourselves there by refusing to love God. Heaven – paradise – is to love God. Originally published on July 2, 2014.